2 July 2009, at 1:59p.m. BRAZIL - In their goal to maximise support to customers, Vencomatic do Brasil has strengthened the South American sales team. Recently, Flavio Candia and Claudio Machado have joined the sales team of Vencomatic do Brasil, responsible for the sales of the Vencomatic and Prinzen product package in South America. Mr Candia will take all sales responsibilities as a Commercial Manager, while Mr Machado has been appointed as commercial poultry specialist, helping customers to fully benefit the advantages of the solutions for hatching egg collection. With the appointment of these two professionals, together with sales manager, Etore C. Schirato, the sales team at Vencomatic do Brasil is now complete and ready to fully support our customers in the South American continent. The 21st Brazillian poultry congress was the first platform where customers could meet the new sales team. 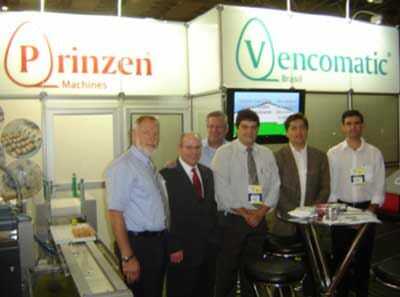 Vencomatic do Brasil has been set up in 1999 to deliver custom-made solutions to the South American poultry market. The company specialises in solutions for automatic hatching egg collection, resulting in more first class hatching eggs and higher profits for broiler integrations. The strong relationship with customers has led Vencomatic do Brasil to grow to a well respected equipment supplier for the South American market.